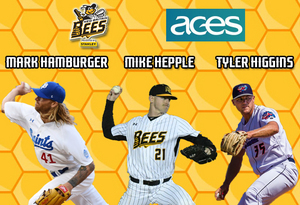 (New Britain, Conn., March 27, 2018) – The New Britain Bees today announced the signings of pitchers Mark Hamburger, Mike Hepple, and Tyler Higgins. Mark Hamburger joins the Bees for his 12th season of professional baseball after being acquired in a trade with St. Paul of the American Association. Over the last two years with the St. Paul Saints, the former big leaguer made 44 appearances (42 starts), posting a 25-12 record with a 3.43 ERA and 215 strikeouts over the course of 330.2 innings pitched. Hamburger was originally signed as an undrafted free agent by the Minnesota Twins in 2007, and spent one year with the Twins organization before being traded to the Texas Rangers in 2008 for Eddie Guardado. After three successful campaigns in the Rangers organization, he made his Major League debut in 2011, appearing in five games and collecting one victory with a 4.50 ERA. After stints with the Padres and Astros organizations, along with St. Paul, the righthander would rejoin the Twins organization in 2014 and made his New Britain Stadium debut by appearing in eight games for the Rock Cats. The 31-year-old holds a record of 57-50 with a 3.62 ERA, 764 strikeouts, 19 complete games, and four shutouts over the course of 973.1 innings in 348 minor league appearances (83 starts). Mike Hepple returns to New Britain for his sixth season of professional baseball and second in the Atlantic League. Last year with the Bees, the Connecticut-native appeared in 43 games and posted a 2-2 record with a 3.23 ERA and 61 strikeouts over the course of 55.2 innings pitched. The 27-year-old began his professional career in 2013 with the Washington Wild Things of the independent Frontier League. After one campaign in the independent ranks, he was signed by the New York Mets the following season and spent three years in the Mets farm system, reaching as high as the Double-A level with Binghamton in 2016. In 161 career minor league outings, Mike owns an 11-10 record with a 3.66 ERA and 174 strikeouts in 238.2 innings pitched. Tyler Higgins heads to New Britain for his eighth season of professional baseball during his Atlantic League debut. Last year, he appeared in 34 games for Double-A Jacksonville (Miami Marlins) of the Southern League, where he posted a 3-3 record with a 3.43 ERA and 47 strikeouts in 60.1 innings of work. The 26-year-old was drafted by the Marlins in the 23rd round of the 2011 MLB amateur draft. He spent his entire minor league career with Miami, reaching as high at the Double-A level, where he debuted at in 2014. Over the course of 197 minor league appearances, Tyler owns 12 wins, with a 3.72 ERA, eight saves, and 242 strikeouts over the course of 307.2 innings pitched.